Kindle DX is not yet available, so if you would like to purchase it you can place your order and join the line….or if you just want to check it out, go to Amazon’s website. I am not sure what the goal is here with the Kindle DX since it is not much different from Kindle 2 in terms of function. 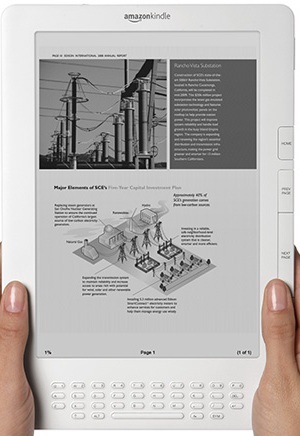 The only notable differences are size, native PDF, content capacity, and auto-rotating screen. Up to the time of this post, we are not yet sure if ads will be allow to appear in periodicals and newspapers. We will keep you posted on that, since its something we are expecting to see if not now later…I really don’t think Amazon can continue to ignore it, since competitors are lining up for that very reason. Book in under 60 secs. What I’ve shared above is based on my experience. I would love to hear what you have know about these devices. Feel free to make comments below for the benefit of other readers.! Slim: Just over 1/3 of an inch. Library: Holds up to 3,500 books, periodicals, and documents. Display: 9.7″ diagonal e-ink screen with 16 shades of gray for clear. Auto-Rotating Screen: auto-rotates from portrait to landscape as you turn the device so you can view full-width maps, graphs, tables, and Web pages. Wireless: 3G wireless allows immediate download of books right from your Kindle DX, anytime, anywhere; no monthly fees, no annual contracts, and no hunting for Wi-Fi hotspots. Read-to-Me: With the text-to-speech feature, Kindle DX can read newspapers, magazines, blogs, and books out loud to you, unless the book’s rights holder made the feature unavailable. Book Selection Available : Over 275,000 books; New York Times Best Sellers and New Releases are only $9.99, unless marked otherwise. Newspaper Magazines & Blogs: U.S. and international newspapers including the New York Times and Wall Street Journal, magazines including The New Yorker and Time, plus popular blogs, all auto-delivered wirelessly. For more information go the Amazon.com Website . Amazon kindle 2, the next generation wireless reading device has arrived and will be officially released on February 24th…I can’t wait to see if it lives up to the hype. To get yours hands the device, you will have to order quickly, join the line and wait. Just how long you will have to wait is not yet clear. One thing is sure, though, the line is getting long very fast. It’s been just over a year since Amazon launched the initial, Kindle 1. Since its launch, many bought into it and became early adopters. Yet, the device was not without many flaws including clumsiness – not being able to hold it without inadvertently turning the page, not having wireless access in some areas, and the delayed reaction associated with turning the pages. This hardly seem to justify the initial $400 price tag slapped on it, which later became $359. This, of course, did nothing to deter buyers many of whom wanted to be a part of the revolution – a new and easy way to access and read materials on the go. Many agree that turning out Kindle 2 at this time is a great idea. After all, it’s been the topic of debate for quite some time. However, they were hoping that Amazon would consider allowing them to trade in their “old” kindle 1 for the new and improved Kindle 2 at a much reduced price. Will this happen? I don’t think so. For now, if you want to get Kindle 2, you will have to fork out another $359, even if you are an early adopter… I guess this means that you will just have to stack them up, each time a new generation comes out…unless of course Amazon decide to work something out. At this rate, you may even see a new generation Kindle at the turn of each year…who knows. In any case, I am still going to get one. So, what does this new device offer? From my understanding, it still provide the convenience of reading what you want, when you want it. You can still have immediate wireless access to books all delivered in less than 60 seconds…from the Kindle store of course…and its free. Also, it still can “disappear” in your hands so you get lost in the author’s words. * Improved display provides crisper images and text – now boasts 16 shades of gray. * Faster Page turning – 20% faster. * Longer battery life- 25% more. * New “Text-to-Speech“ features means Kindle can even read out loud to you. Present Kindle owners are given priority to be the first to get their hands on the next generation Amazon Kindle 2 device, but must order before midnight on February 10th. You don’t want to miss this…I am off to get mine. Prev page button: Returns you to the previous page in your reading material. Back button: Similar to the BACK button on your web browser, this allows you to retrace your steps. Select wheel: Roll the wheel to move the cursor up and down the page. Press it to select a particular item. Cursor bar: Contains the cursor, which is a silver rectangle that allows you to select a particular line on the display. You move the cursor up and down using the select wheel and press the select wheel to perform an action. You can also get around inside your book or periodical by selecting locations from the menu. The top portion of the menu provides selections to help you navigate your reading material. You will have slightly different options depending on the content you are reading. Home: Takes you to your Home screen. Shop in Kindle Store: Takes you to the storefront of the Kindle Store. Go to Cover: Takes you to the cover page of the item you are reading. Table of Contents: Takes you to the table of contents for the item you are reading. Go to Beginning: Takes you to the place in the book the publisher considers to be the beginning. Go to Location: Displays a text entry box that allows you to jump to a specific location in the content. Go to Bookmark: Displays a list of bookmarks you have made in the content. Add/Delete Bookmark: Adds or deletes a bookmark on the current page indicated by a dog ear corner at the top. My Notes & Marks: Displays a page containing all of your current item’s notes, highlights, and references to your bookmarks and clippings. Save Page as Clipping: Adds the entire page to your My Clippings file in Home. Go to Front Page: Takes you to first page of the periodical you are reading. Go to Articles List: Takes you to the list of all the articles in the item you are reading. Go to Sections List: Displays a list of sections identified by the publisher of the periodical such as Local or Sports. Not available in blogs. Buy this Book Now: Connects to the Kindle Store, purchases, and downloads the full book to your Kindle. Only appears if you are reading a sample. See Details: Connects to the Kindle Store and displays the detail page for the full book. Only appears if you are reading a sample. Your reading material may also contain links to other places in the document. For example, in many books the Table of Contents is set up to link to the content pages. These links are easy to spot because they are underlined. When you select a link using the cursor bar and select wheel, kindle takes you to the place indicated. After you have finished looking at what you have linked to, you can press the Back button to return to your previous location. Your reading material may also contain external links that take you to locations on the Web (if you have your wireless service turned on). 3) you have instant access to more than 90,000 books including 100 of 112 current New York Times® Best Sellers. You can get all the New York Times® Best Sellers and New Releases for just $9.99, unless marked otherwise. 4) Its revolutionary electronic-paper display provides a sharp, high-resolution screen that looks and reads like real paper. 5) You can test kindle to see if it works for you by simply downloading free book samples and read the first chapters for free before you decide to buy. 6) All of the top U.S. newspapers including The New York Times, Wall Street Journal, and Washington Post are available at your fingertip. The top magazines including TIME, Atlantic Monthly, and Forbes are all auto-delivered in an instant. 7) You can also access the top international newspapers from France, Germany, and Ireland; Le Monde, Frankfurter Allgemeine, and The Irish Times-all auto-delivered wirelessly. you can access more than 250 top blogs from the worlds of business, technology, sports, entertainment, and politics, including BoingBoing, Slashdot, TechCrunch, ESPN’s Bill Simmons, The Onion, Michelle Malkin, and The Huffington Post-all updated wirelessly throughout the day. Its lighter and thinner than a typical paperback and it weighs only 10.3 ounces. It holds over 200 titles, has a long battery life, and may be left wirelessly on and recharge every other day. You can turn the wireless off and read for more a week or more without recharging and It can be fully re-charged within 2 hours. 9) You will have no monthly wireless bills, service plans, or commitments. For the wireless delivery, you can simply click, buy, and read. 10) You can email your Word documents and pictures (.JPG, .GIF, .BMP, .PNG) to your Kindle for easy viewing while you are on the go. This is the response given by J.A. Davidson to the storage question: “Matthew, you’ve got a couple of choices. For AZW formatted books you buy through Amazon, they will maintain a copy on their servers that you can re-download when you like over whispernet or via Internet to your PC. Another choice you’ve got is to purchase an SD memory card. They are available in differing sizes from 256MB up to 8 GB. (Micro Center usually sells 2GB cards for $19.95). A 1 or 2 GB card will hold significantly more than 200 ebooks. IT’s probably the best option if you want to play audiobooks and mp3 files on you Kindle. However, in the long run, your best bet for storage will be on your PC. You can get a card reader for $5-$20 that you can plug your SD card into , and transfer files that way (The SD card shows up as a removable drive on your PC.) or you can use the USB cable to transfer files to the Kindle. Another option I plan to try when my kindle comes in, is to use a storage company like Streamload to store your ebooks on the Internet. You ought to be able to use the whispernet to access Streamload’s site, and then download any of your files directly to the Kindle. Saw, thought it was interesting and though I would share for the benefit of those who have the same questions.